I will admit, most of my perceptions of K-Town come from the addictively awful show K-Town about young Koreans living (and partying) in that area of LA. I know that over the last few years, the area seems to be booming with restaurants. 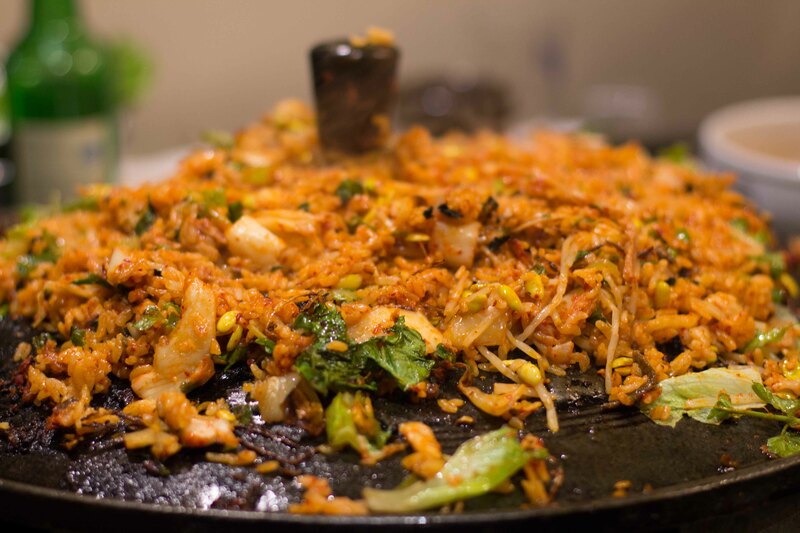 Last year, I had a meal at La Guelaguetza and while I drove through the neighbourhood seeing all the Korean restaurants, I wished that I could experience some authentic K-Town dining. So this year, when friends asked if I was interested in going for Korean bbq in K-Town, it didn’t take but 1 minute before I responded YES! Before the dinner, there were messages of warning not to eat too much for lunch that day, but I’m in LA for such short periods of time that of course I didn’t listen. Chef Roy Choi’s Commissary at the Line Hotel was something that has been on my radar, and then kept coming up in conversations while I was in LA, as somewhere I should make a trip to try. 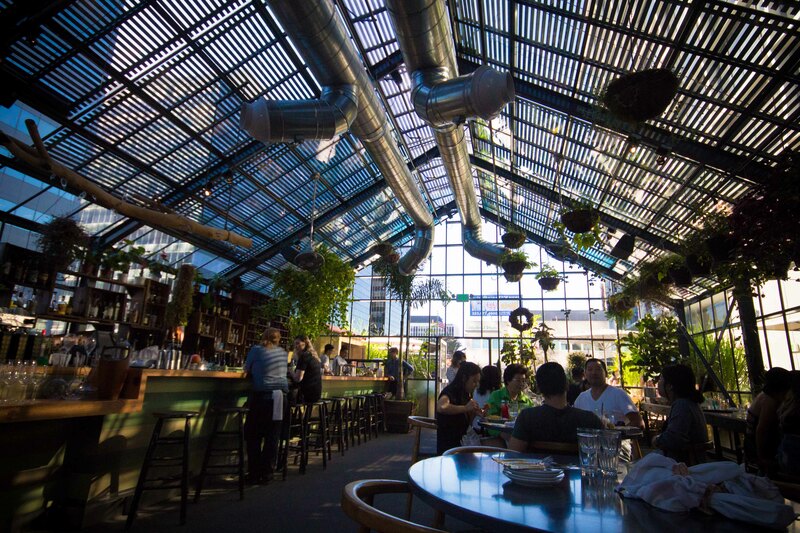 A vegetable focused menu, in a dining space that was a greenhouse, seemed like the perfect place to go for lunch before my meat focused dinner. The menu at the Commissary is interesting. It was only pictures of the food with a price beside it. 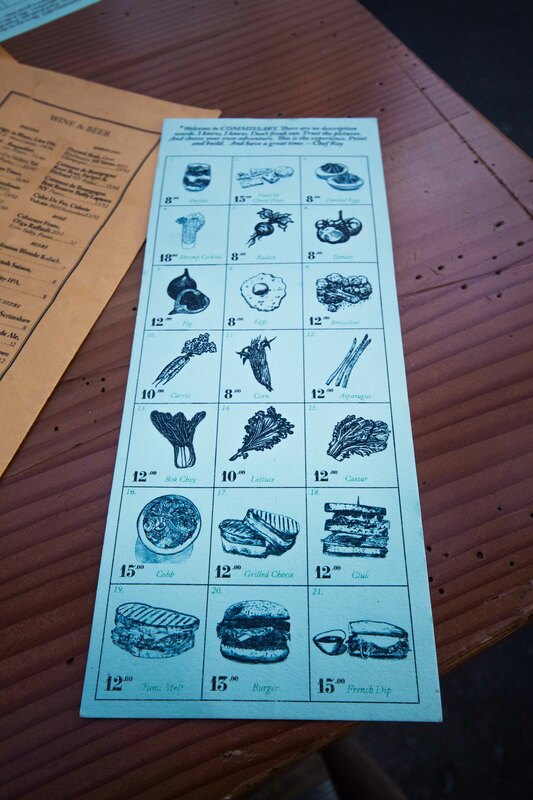 As the instructions at the top of the menu state, “Welcome to the COMMISSARY. There are no words. I know, I know. Don’t freak out. Trust the pictures. Choose your own adventure. This is the experience. Point and build. And have a great time. – Roy Choi”. The menu is so unique and I’ll admit, I flip-flopped between being freaked out and just wanting to point blindly at things. 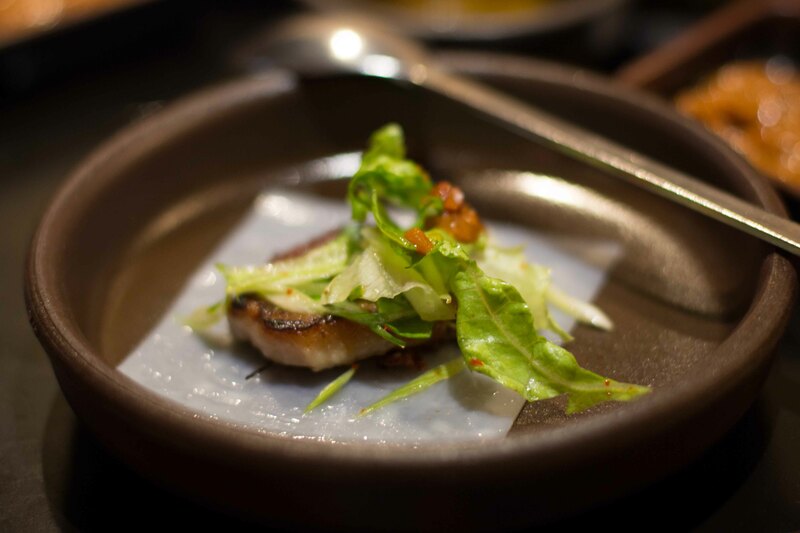 I was happy I’d done a bit of research beforehand, so I knew a bit of what to expect but also enjoyed feeling adventurous in my dining experience. Mission accomplished Roy Choi. 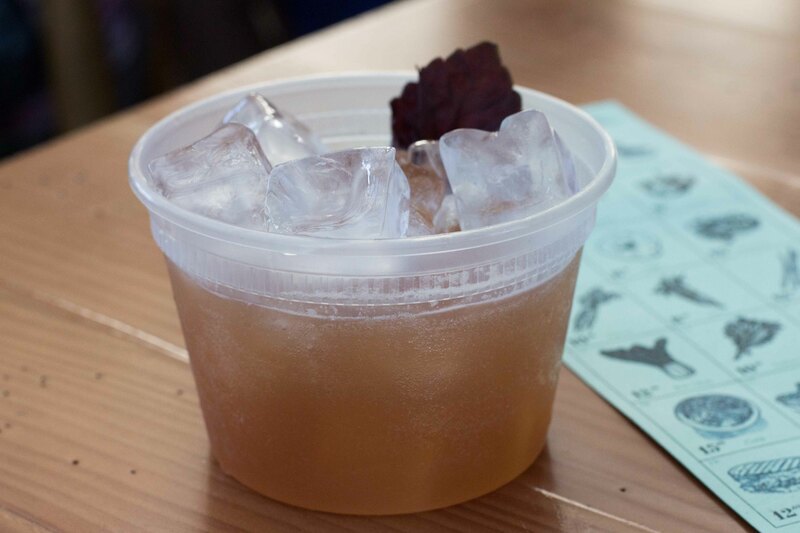 Delicious Pimm’s cup served not so deliciously in a plastic container. 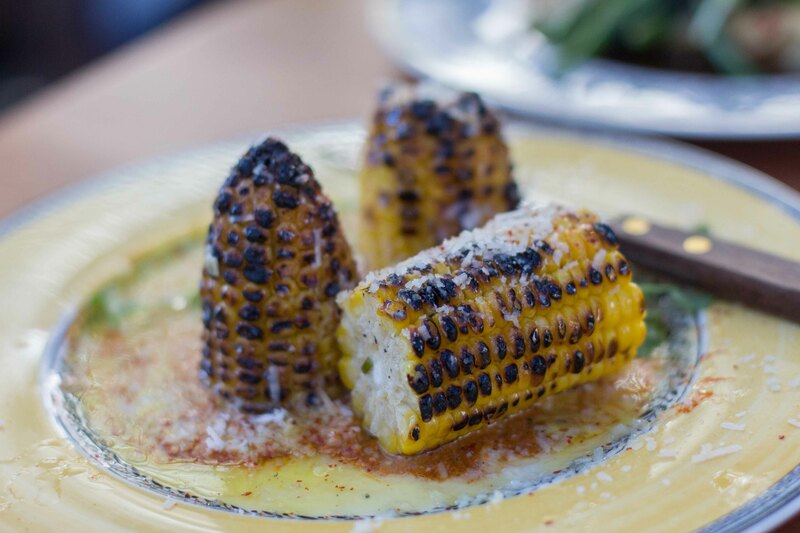 A take on Mexican elote, the grilled corn sitting on top of a yellow and red sauce was my favourite of the day. Some people went to the trouble of cutting the corn off the cob. I didn’t, but must admit I double/triple dipped my corn back through the delicious sauces. 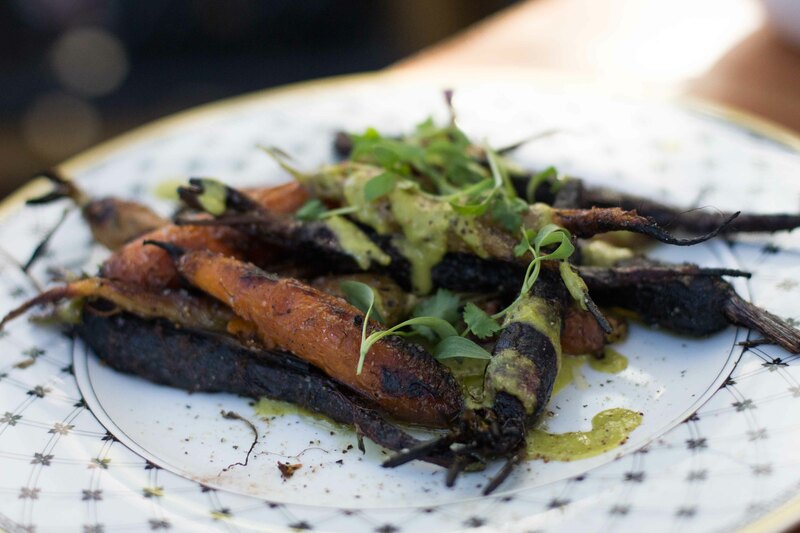 Earthy sweet roasted carrots were topped with a bright green sauce where the cilantro and garlic punched through. 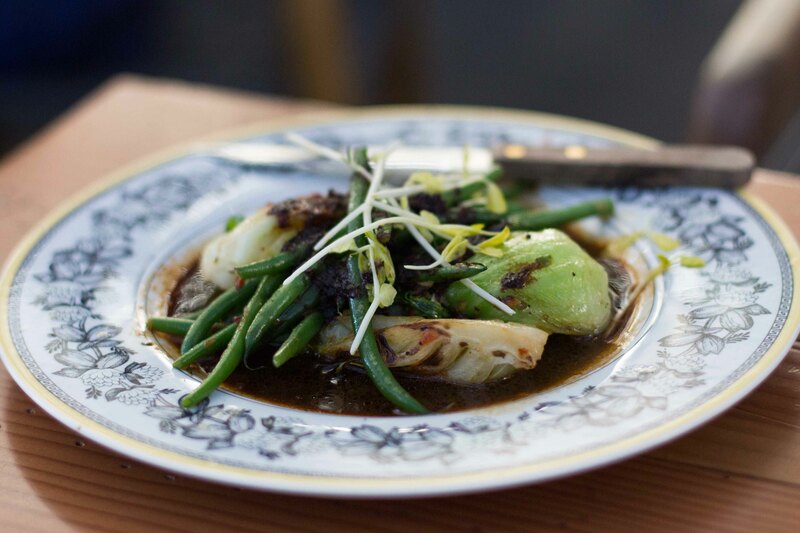 Bok choy with green beans topped ladled with a rich brown sauce. 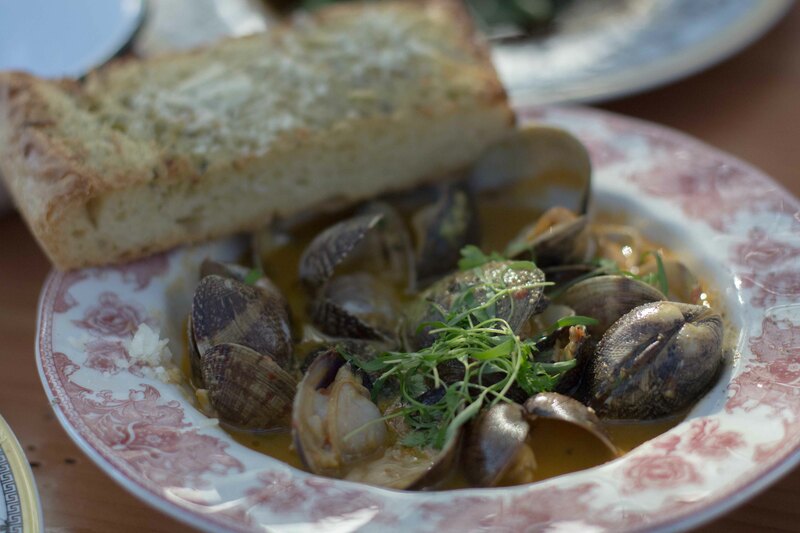 Clams swimming in a complex chicken based broth with bacon, garlic and chilis. The garlic bread on the side was the perfect vehicle to mop the bowl clean. Dinner was at Honey Pig, a very large Korean bbq restaurant and even with reservations, we ended up waiting almost half an hour for our table. Part of me felt like we waited that long though because they seemed to put non-Koreans all in one corner of the restaurant. 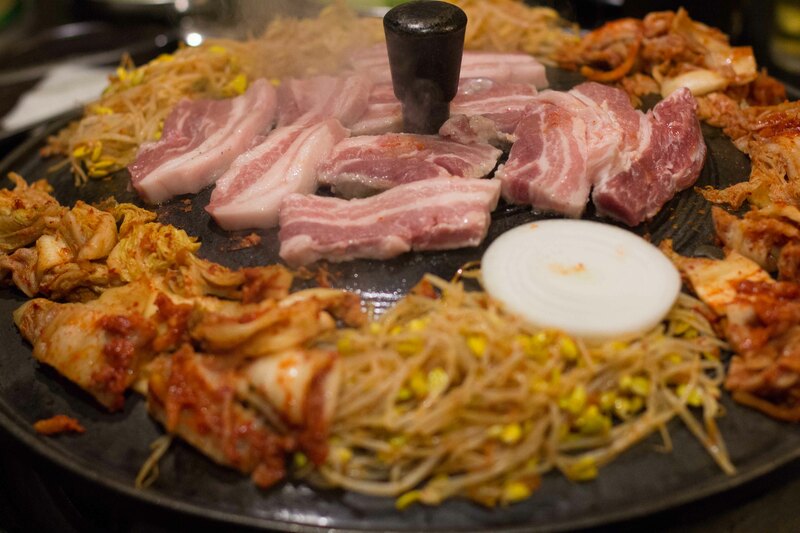 I love Korean barbecue, and although it’s something I can get at home, it’s rare that I do. 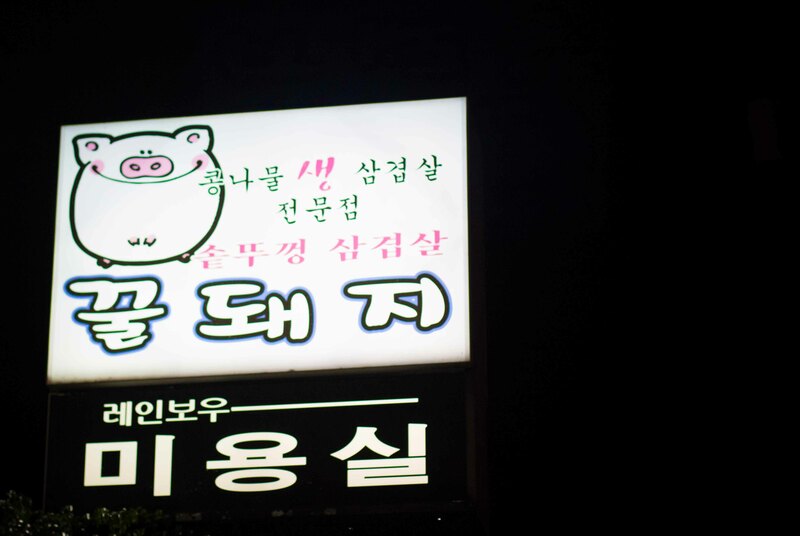 There was something so exciting about going to K-Town to eat bbq, like we were going to enjoy a meal like the locals do. 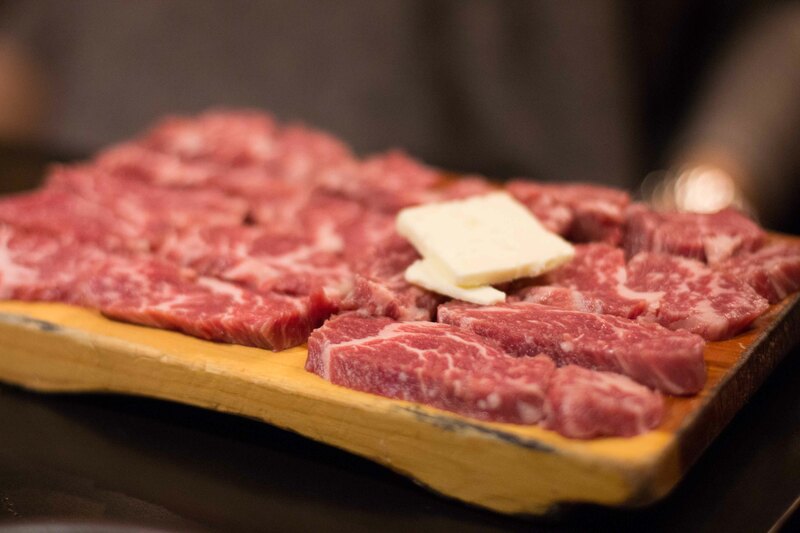 Hanging out for hours around a giant grill filled with meats isn’t the kind of thing you can do with just anyone. It takes a certain comfort level to eat this way, knowing you’re going to over-indulge and leave the restaurant feeling full and having your clothes smell of meat. I’m happy that I have the opportunity in LA to experience this type of eating. As we were seated, we quickly ordered beer and soju. The drinks flowed easily throughout the night. 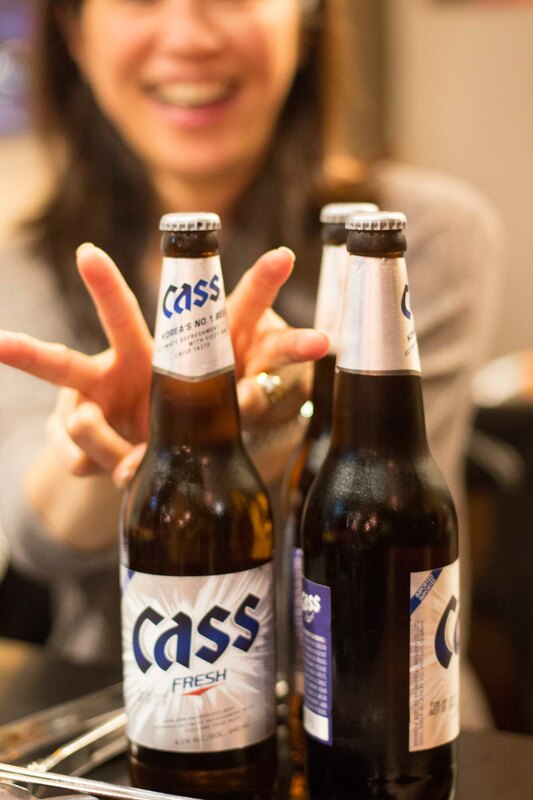 I was a bit sad not to be served Hite beer, which seemed to be the beer of choice on the K-Town show, but the easy-drinking Cass Fresh did the trick. 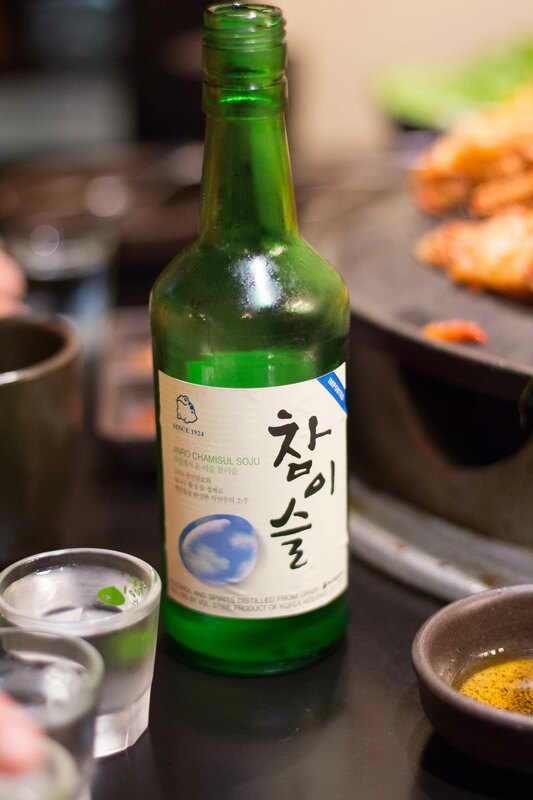 I’ve never had soju before, but enjoyed its smooth, clean flavour. Kimchi and bean sprouts were placed on the grill as soon as it was hot. And then the special “black” pork belly. This is when the magic starts to happen. The soft rice paper was a great vehicle to wrap up the meat. 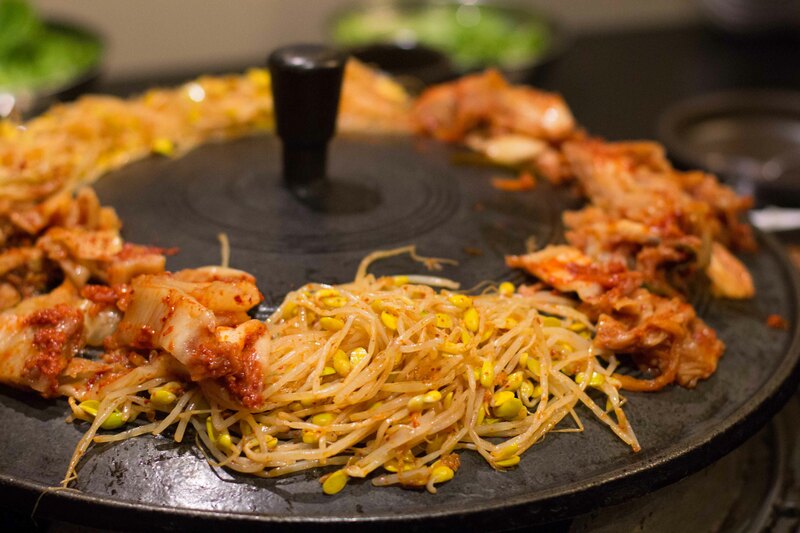 Other than the kimchi and sprouts, there are no other banchan (side dishes) served at Honey Pig. I was sad when I learned there would be no other veggies to pick at, but it did give me more room to eat more meat. 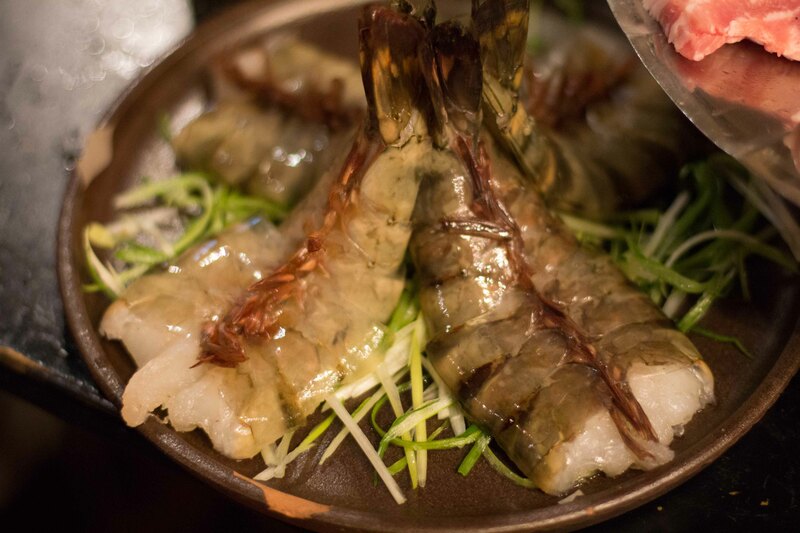 Giant prawns, which are always a disappointment, because it’s hard not to over-cook them. Short rib, normally my favourite at Korean bbq was good, but the pork belly was still much better. I’m sure they have a different name, but these were ordered as “ice noodles” and came out that way. 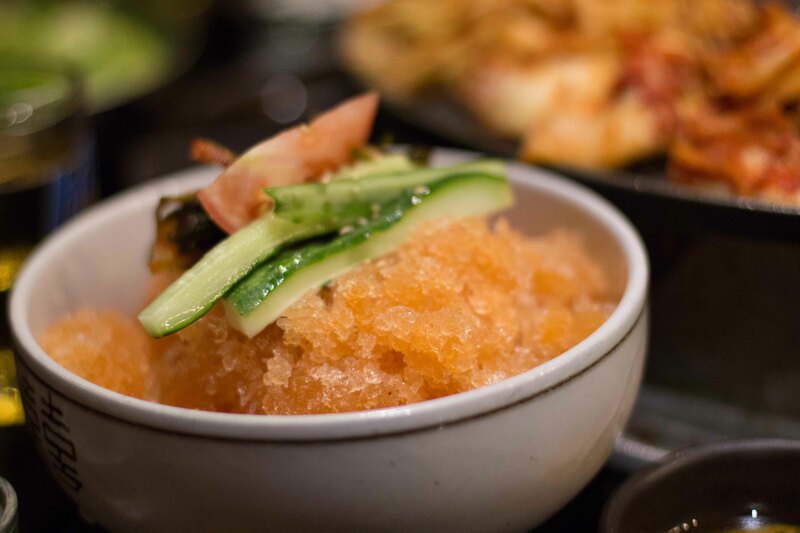 Thin noodles topped with flavoured ice. Completely refreshing and a nice way to cut through all the fat I was consuming. For the meal’s finale, rice is placed on the grill and mixed up with whatever is leftover on the grill (in our case not much). It’s left to sizzle away and crisp up. Thoroughly stuffed, I was happy that I wore my buffet pants for the meal. Happy like a pig in… honey. Next PostNext Festival El Saber del Sabor Begins!